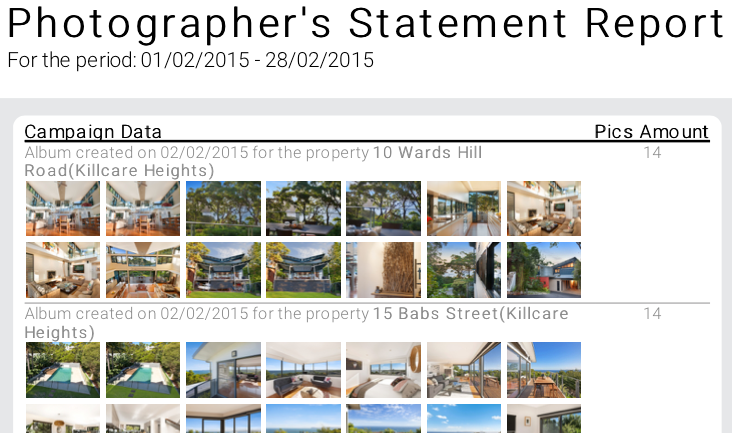 We will soon be releasing an exciting new update to iMAGECLOUD’s online cloud solution for photography professionals. Our ongoing commitment to improving and sharpening the user experience has resulted in a significant update to simplify the user interface, improve ease of use, security, workflow and overall system performance. On Wednesday, April 1st you will be able to enjoy the following major features of the renewed platform. SSL implemented across the entire site. This means every aspect of your workflow including your account, data and invoice information are safer than ever. Your login and account security has been improved. Campaign related actions from the main menu have now been grouped under ‘Campaigns’. Suppliers, Clients and Suspended Users (unpaid clients or ex-employees) are now grouped under Contacts in the main menu. Profile, Feedback Ratings, ICPP and Notifications have all been placed in the top right hand corner under a options cog. 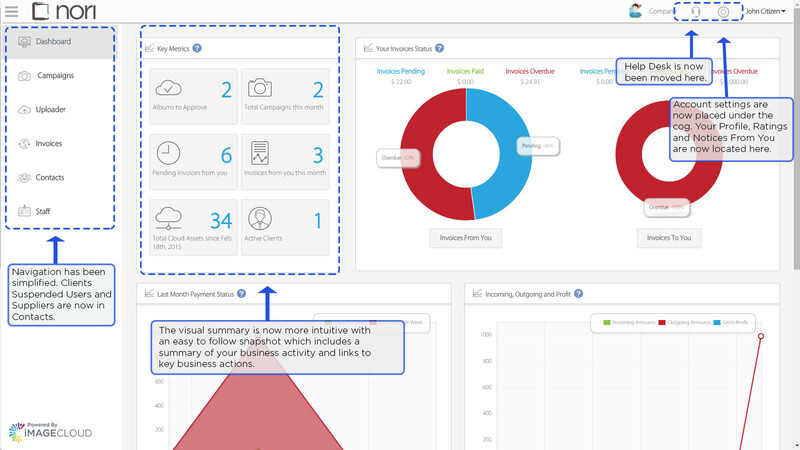 We have provided more relevant information on the dashboard for your business needs with an improved visual summary. 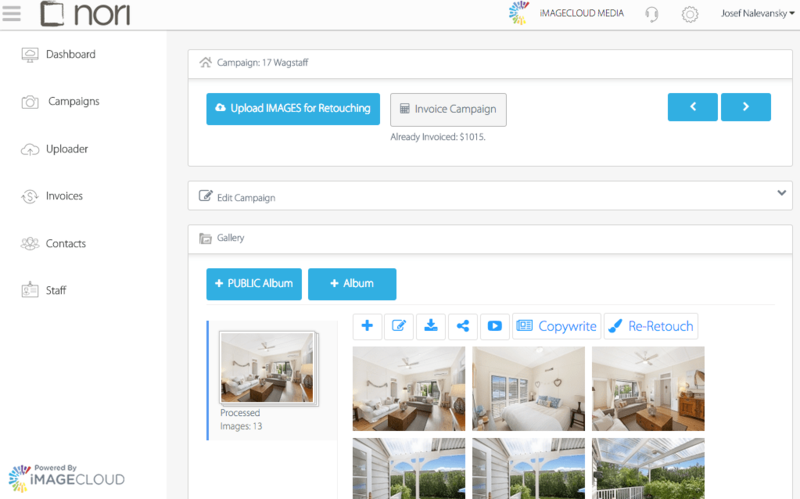 Email notifications and invoices have been restyled to reduced iMAGECLOUD branding to emphasis your business, they will now only include your business’ logo. You can now create and assign campaigns to your business instead of directly to a client. This allows you to have the final say for all aspects of the campaign before delivery to your client. See the new campaign view below. Updated Traffic Lights: Members and suppliers can now send messages to each other concerning campaigns directly from their pending jobs que! Personalisation – Emails from Nori are coming from you more than our previous versions. The email signature creator is now attached to all of your emails system wide, meaning the client will see your details with every piece of communication. Clients can now reply directly to you from any system sent email. Google location integration for Campaigns makes it easier to verify campaign locations. We have eliminated No-Reply emails greatly reducing the possibility of your emails going into spam with your clients. Managing Your Account Just Got Easier! 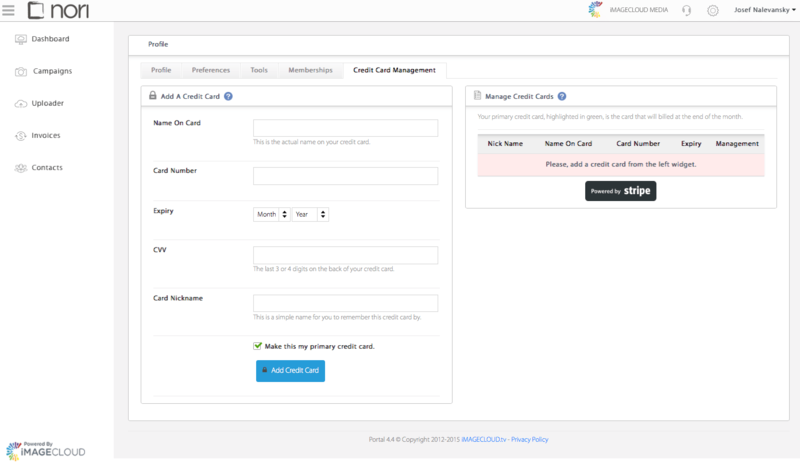 iMAGECLOUD has partnered with Stripe to simplify your billing experience by providing an automated credit card subscription to manage your account. Your credit card information will NOT be stored with iMAGECLOUD, they will be stored securely with Stripe. Your account email is now your login user ID, making it easier to remember and switching levels of membership with iMAGECLOUD has become simpler as well. Attached with your invoice statement every month will be a visual itemised account of your Digital Asset Management Fee charges. See below for an example. Location no longer affects your load times system-wide. Previous versions ran from only one region (Sydney) and would affect load times from locations remote from the server. iMAGECLOUD’s Nori has now implemented a dedicated global network with Amazon which has significantly improved the load speeds of key areas of your workflow, no matter where you are around the world. If you need any help with the new release please feel free to contact support and submit a help desk ticket using our help feature now located to the top right corner of Nori.